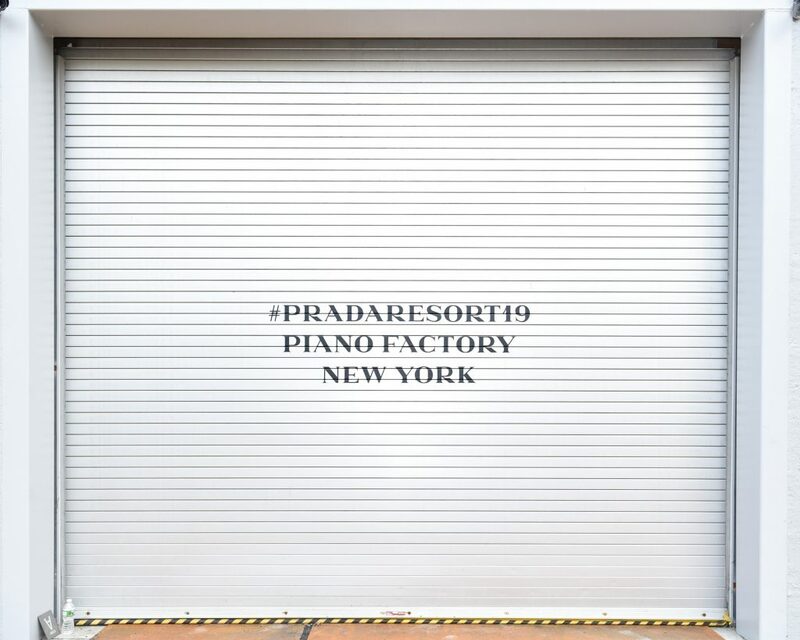 Prada Resort 2019 Show at Piano Factory, NYC. Photograph by Griffin Lipson/BFA.com. Copyright BFA. The music producer crafted a show soundtrack inspired by timelessness and Daft Punk for Prada’s 2019 Resort show. As one of the biggest show music producers in fashion, Frédéric Sanchez has created show music pieces for the biggest names in the fashion industry since his first live show gig for Maison Martin Margiela show in 1988. Ahead of the first Prada’s 2019 Cruise show in New York—its first in the city after a 20-year absence—Miuccia Prada tapped Sanchez, a long-time collaborator with the designer to provide a soundscape for the show that was unquestionably 90s—think lots of Daft Punk and R.E.M. Document spoke with Sanchez backstage at the designer’s headquarters, a former piano factory on West 52nd Street, following the show’s noisy melange of technical fabrics, loud prints, and graphic logos placed front and center. Document—How did you land on this particular musical direction for the show? Document—What was the specific mix? Frederic—I used two specific songs from that record [1997’s Homework], but I kept only the rhythm, and we remixed in a way that makes it even more contemporary. Then, we had three songs mixed with this a track from the film Donnie Darko, Gary Jules’s ‘Mad World’, and then the song ‘Wake Up’ from a band called Mad Season. It’s two musicians, one from a band called Alice in Chains from the grunge era, and another one from Pearl Jam. Then, we used an R.E.M. song. Document—What was the R.E.M. song that you used? Frederic—The R.E.M. song is The One I Love. It’s from an unplugged record. Frederic—Yes! So very classic songs and very romantic in a way. The obvious thing would have been to use the electronic sounds from Daft Punk to open the show, but we used the song from Donnie Darko, which is a very, very romantic thing. Then, suddenly, you have that clash with the very strong electronic beat coming in. So, it’s really these two things that are clashing through the whole show. Document—It’s impossible to tell whether something will stand the test time without substantial distance. R.E.M. is a really great example of that. I feel like they hit the peak of their pop-stardom in the 90s then kind of fell out of favor as the decade came to a close. But, I think a lot of their music sounds really fresh now when you revisit it. Document—I think they start to mean different things to different generations. Frederic—I think it’s very difficult to look at what is happening in the current moment because there’s so too much of everything. I think the only way to create something that resonates is to go deeply into yourself. Document—To let intuition guide you. Frederic—Exactly, yes. It makes it personal and sensitive. Document—Mrs. Prada must be a fantastic person to collaborate with in that case. I feel like intuition is very much a tool she uses to navigate each season. Frederic—Completely. It’s fantastic because she pushes you to go deeply into what you want to create and what you think. Document—How early do you start working on the soundtracks for the shows? Frederic—I work for Prada all year long, so I am researching all the time for them, but I called them maybe two weeks ago to discuss music for this show. The process really starts the moment when they put the clothes together and do the fittings, so like a week before the show. I arrived in New York on the Monday before the show and was there everyday. When making the soundtrack for the live event, I always like to use existing music because it’s almost like the effect of perfume. I can transfer emotion through references. There’s a sort of romanticism and poetry to the songs. The rhythm tells you something about modern things, architecture—the modern world as we know it.